Elegant French Bread Nantucket Basket, hand-crafted with a fine-grain cherry wood base, traditional hand-tapered and beveled cane staves, and dyed rattan rims. The rims are single lashed and nailed. Traditional Nantucket basket details and fine craftsmanship on a modern Nantucket basket! This French Bread Nantucket Basket features a set of special cherry and oak laminated handles, which obtain their strength from the oak, and beauty from the cherry! I can also craft this useful Nantucket basket using traditional hand-carved cherry or oak wood "heart" shaped handles for a more antique and refined design. The traditional rattan reed basket rims are pre-drilled, then nailed with thin brass escutcheon pins, which are cut flush, peened over and sanded smooth. The basket rims are then single lashed in cane, with a broad piece of formed cane on top of the rims to cover the slim gap between the inside and outside basket rims. As in all fine Nantucket basketweaving, an additional piece of cane is used under the rims of the body - covering the slim gap between the rims and the weaving. The entire Nantucket basket is given multiple coats of hand-applied varnish are applied to both the inside and outside of the basket. This brings out the full beauty of the natural materials, and helps to protect and strengthen the basket. All the hardwood parts are given even more attention to protect and burnish, bringing them a deep luster which is glass-smooth to the touch. These, and many other fine details, set my Nantucket baskets apart from all others. As with all finished Nantucket baskets, please use a fabric liner when used to serve food items. Not only does this protect the Nantucket basket from unnecessary stains, but will also serve to extend the life of the finish of your French Bread Nantucket Basket. Signed and dated on the base. As with all baskets used for food display and serving, please use a fabric liner. 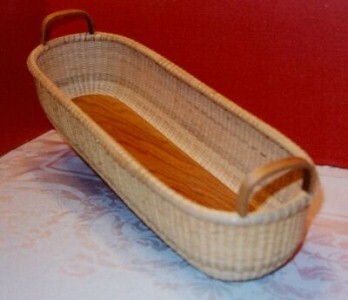 The French Bread Nantucket Basket measures 18.5" long x 6.25" wide x 4" high and 5.5" high at handles. Although I am no longer accepting orders for the Nantucket Basket French Bread, I may craft one or two of these per year. When its ready for sale, you can purchase it directly from my Simply Baskets website.